Goliath Games is growing its presence in the sporting category with the acquisition of Wahu, the #1 Australian outdoor brand. Where's there's water, there's Wahu! “With hits like Zoom Ball Hydro and Rocket Fishing Rod, Goliath is excited to continue to provide fun activities in the water and sporting category,” says Jochanan Golad, Managing Director of Goliath. Goliath is pleased to announce it has acquired Wahu, the #1 Australian outdoor brand that features unique beach toys for kids and families. The line will debut in North America in Spring 2019. 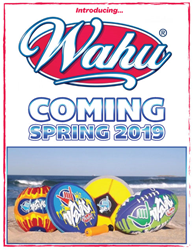 The Wahu brand embraces all aspects of the outdoor lifestyle with products ranging from inflatables, swim vests, and glow-in-the-dark outdoor fun as well as a wide variety of sporting goods. Wahu’s mission is to create quality products that promote a healthy, active lifestyle through outdoor activities for both kids and adults.